I want to tell you a story. Or rather I just want to tell you something...lots of things. All. The. Things. For most of my life words have been my focus; words on paper that I wrote with a #2 pencil (or many colors of Gelly Rolls); words written with an extremely heavy hand that imprinted them on after page after page but gave that good crinkle sound when the sheets were turned. More recently, I type my words with that click-clicking sound in the notes on my phone in the short minutes I can sneak away from the two little humans that opihi me. But though I’ve wanted to, I’ve never really shared much of my writing, only here and there in scattered moments in classrooms. And in my life now, words take a backseat. Now I communicate with lines and dots and curves (drawn in the same #2 pencil) made into a design or pattern on my computer, then transferred to transparency to silk-screen to fabric. One of my pieces is about collecting shells on the beach with my son, another is about finding a sparkling diamond ring on the stalk of a baby banana plant. One is even a story of stubborn triumph, how in a period of desperation I surrendered to the idea of making a pineapple print instead of using other maybe more logical avenues to bring my business back from the brink. When I look at it now, the pineapples still smirk at me with their tiny crowns, prickly symbols of resilience. But I don’t take it for granted: first, the power of the pineapple, second the power of art. This is the story of how I got my start. I don’t think it’s good to have too many regrets or to not respect the journey that got you to where you are, but I often wish I had known much earlier than I did what I wanted to do. I have always loved art. I don’t remember a time when I wasn’t doodling or drawing something. I’m pretty sure though, that after only about the first or second grade I had already thrown out the idea of becoming an artist (or a zookeeper, for that matter, after I figured out I might have to shovel poop). But art just never seemed like a viable option for me to pursue. I thought there was no way I was capable enough or good enough. So after college, armed with a degree in English and a liberal arts education (which inevitably prompted people to ask me if I was going to be a teacher) I floundered with uncertainty and self-doubt. At one point, because I wasn’t allowed to go on the internet or even really do anything, I would sit for hours and hours of the day in a crazily disheveled midtown Manhattan office memorizing the Presidents of the United States (in chronological order) from a ruler. My boss, the owner of the tissue-box making company where I temped for about 10 months during my stint in New York City eventually broke the camel’s back and sent me (by myself, by subway!) with $1000 in my pocket to bail his brother out of jail. Still, it took a couple more years and sitting in a couple more cluttered cubicles doing math or arranging calendars for me to realize that I needed to start over. 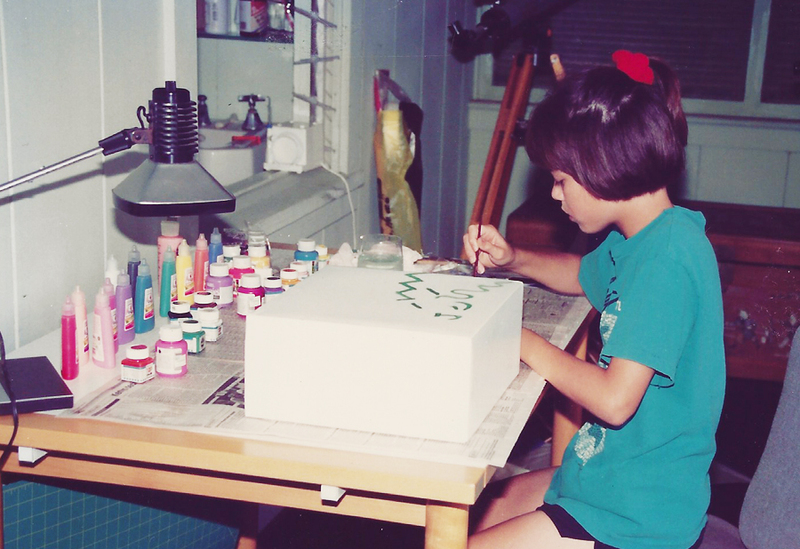 At 26 I enrolled in college for the second time to study Interior Architecture and Design. It was one of the scariest things I have ever done, (and I’ve jumped out of a plane). My uncertainty was at a screeching peak when I sent in the forms but I had finally hit a point where I felt sick clocking in and clocking out every day not really caring about anything I did all day long. And like I am with most things, I jumped in head first, driven by emotion and intuition instead of logic. This time I worked really hard in school. I still felt unsure of my capabilities as a designer, especially surrounded by talented 17 and 18 year olds, but this time, I was totally invested and for me, it was do or die. Then unexpectedly my life pivoted in what looking back at it felt almost like a single moment. I took an elective in “Applied Textiles” and discovered my CRAFT. I finished up my degree in Interior Design but from only the second day of Textiles I knew that I had found my forever love. Screen-printing and I, we just clicked. It fit my impatient, maximalist, variety-loving personality perfectly. Surface design and creating patterns was an art form that just made sense to me. I liked drawing something simple and turning it into something else and then changing it with different layering techniques or using different colors. Most importantly this was something I could see myself doing all day every day. Things have changed quite a bit since I started JANA LAM a few years later. Gone is the time I spent screen-printing every day in my parent’s garage until the sun went down, then slowly cutting and sewing each print into bag after bag until the wee hours of the morning. Now I don’t get the chance to print very often; Kellie, already past her 10,000th print I’m sure, has become the master behind each push and pull of ink. I don’t sit in a cubicle, but I do often sit at my desk looking at numbers and emails and schedules. . . bleh. But now I’m surrounded by my own magical world of rainbows every day. Now I love spending my time sketching late at night when I’m almost asleep and the dreams are already quietly bubbling at the edge of my brain. And mostly I’m so lucky to be a part of creating things I love and telling their stories with the people who see them. With writing, I never really got the chance to share much. I gave up on myself before I even had a chance to really try. (I came close, but lost out on a copywriting job at MTV in my first post-Davidson College interview and was shattered by it). Oddly enough though, now art is bringing me back to a time when I wanted to share my words, to tell stories or....just share things. I know my story is not unique; that it can take years and years to find what you’re meant for, what’s meant for you. But if you follow your heart and listen to your gut, just maybe they will take you where you’re meant to be, where you fit and what fits you. When it comes to that passion, that love, whether it’s art or something else, (but especially if it’s art) don’t wait and don’t settle. And most of all don’t doubt yourself. It is that distinct you, your voice, your taste, that makes it SO good. In some way, through my designs and prints I am still telling stories, though they’re not stories you can understand by just looking at them. It’s more about the emotions communicated through them and what they make you think and feel. Anyway that’s my hope, that these selfish creations from my *”heart flow will move you, and make you happy, like music moving through your brain.” I used to worry that my designs weren’t cool enough, that they were too poppy, too cheery, too simple. But I realize now that it doesn’t matter. They are me expressing my love for the world and I want to share them with you. Jana Lam is a Honolulu, Hawaii based design company that focuses on products and accessories for an endless summer. Lam's beach front home once served as the production house of her handmade in Hawaii line of one-of-a-kind, hand-printed and sewn apparel and home accessories. 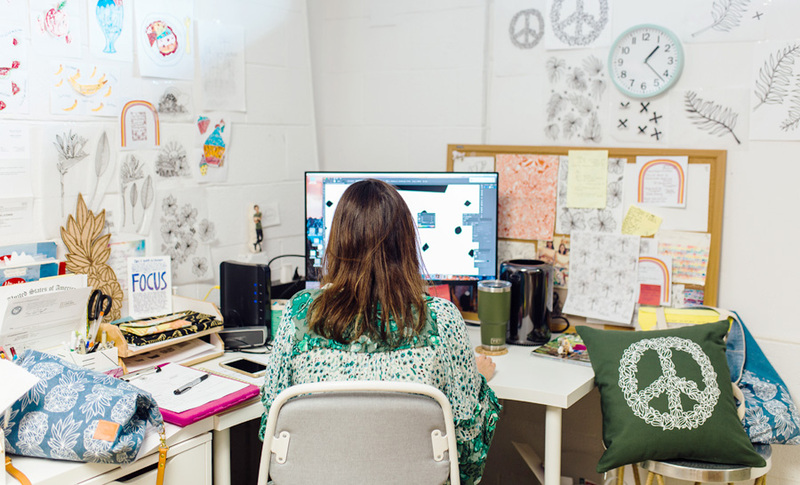 In Fall 2017, printing and production moved out of the home studio, and the Jana Lam Studio + Shop was opened in Kaka'ako.